Armed with their own expertly designed weapons, these master innovators prepare for battle. In World War II, Col. Fritz Klaue was a member of the Nazi "Blitzkrieg Squad" commanded by Baron Strucker, and was assigned to learn the secrets of Wakanda. After the war, he returned home to Belgium and told his young son Ulysses all about his time in Africa. As an adult, Ulysses travels to Wakanda to steal the vibranium he needs to build his sound transducer, but is stopped by King T'Chaka; he murders the king, but the adolescent Prince T'Challa attempts to avenge his father, costing Klaw his right hand. Years later, Klaw resurfaced in New York City, having finished his little science project and managed to convert his entire body to living sound. Yay stupid immortality! Yet again Marvel shows us that there is no such thing as a "normal" scientist (Klaw was a physicist). Also, how would "solid sound" work? Is he loud just by existing? Is it like standing next to one of those hand driers in a public restroom, but, like, all the time? He and Swarm should team up to fight Black Bolt and Banshee. 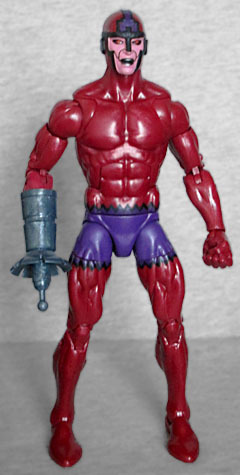 Klaw has always been a fairly slender guy (despite the fact that, since his body is formed of sound, it could be any size he wants), so this toy uses a somewhat skinny mold, and I honestly until this very second forgot there had already been a Marvel Legends Klaw. Sorry, off-topic there for a second. This one's body is bigger and better than that one, and the colors are less "toyish," so I guess all of us who built Terrax can just go sit on a tack. The sonic converter on his right arm is more proportional here, though still much bigger than the comics', and the dish on the end can turn if you want. 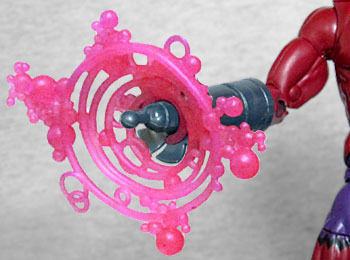 The figure also includes a pink "energy rings" piece to simulate his powers, but it doesn't stay on the end of the gun very well. The head is a new mold, with the costume details sculpted as raised elements (as opposed to the ones on his trunks, which are just painted). It's weird that he's molded with a nose, since the comics often show him with a Voldemort-style nasal smoothness. His skin is bright pink amd his black eyes have red pupils, while his mouth, instead of looking like a speaker or microphone, appears to have silver teeth. At one point, several of Marvel's major villains - Doctor Doom, Norman Osborn, Loki, White Queen, Namor and The Hood - got together to form The Cabal, a group dedicated to ensuring one another's goals. Like the Illuminati, but evil. Namor offered T'Challa a spot with them (basically looking for help overthrowing the rest and installing himself as leader), but T'Challa refused. After the Sub-Mariner left, Doom attacked, injuring T'Challa and putting him in a coma. With their king incapacitated, his younger sister Shuri took over the throne and the role of Black Panther. Although Shuri had been trained in combat by her brother and passed all the trials to prove her worthiness, when she ingested the heart-shaped herb, the Panther God rejected her. Guess he was one of those fanboys who think "SJWs" are ruining Marvel Comics! Not one to be denied, Shuri took on the mantle anyway when Spider-Man's enemy Morlun attacked Wakanda, and fought him despite having no powers. This selfless sacrifice impressed the Panther God finally grants her its abilities. Shuri may dress like her brother, but she's definitely got a different physique! She uses the plain body, with the clawing hands from White Tiger and a belt borrowed from Rogue. Most of her body is black, of course, but the forearms and shins (the "gloves" and "boots" areas, in other words) are a desaturated blue so they stand out. 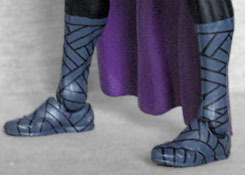 The gloves just have straight lines running along their length, while the boots are patterned like wrapped cloth bindings. The belt is solid brown, allowing you to overlook the X logo on the buckle, and she wears a new golden necklace with two large discs on the collarbones and seven orbs on the chain hanging below. The head is new, but it's nothing special: it's just the Black Panther mask, sized and shaped for a woman's body instead of a man's. The sculpt is good, with small, subtle wrinkles around her eyes, but it's still just a Panther head. Since Shuri was fiercer than T'Challa was, it's a shame they didn't think of the backward-pointing ears in time for her. 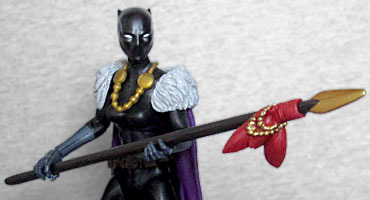 Since Shuri often wore a cape with fur trim, the figure has the same piece Sif wore in the A-Force set - in this instance, light gray fur and a regal purple body. 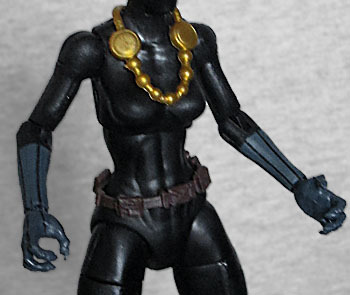 In fact, the entire thing seems to be based on a specific piece of art, which not only saw Shuri in a purple cape with gray trim, but also gave her a necklace with large beads on it, wrappings instead of real boots, and a bit of a utility belt. I think we've found our inspiration! It even showed her holding a spear, and this set comes with a repainted version of Kraven's accessory, which looks better here than it did with that Walmart-exclusive version of her brother. Black Panther has a balljointed head, hinged neck, swivel/hinge shoulders, elbows and wrists, a balljointed torso, balljointed hips, swivel thighs, double-hinged knees, and swivel/hinged ankles. The ankle hinges are quite stiff, and it feels like there's danger of the swivel peg breaking when you try to tilt them - so definitely be careful with that. 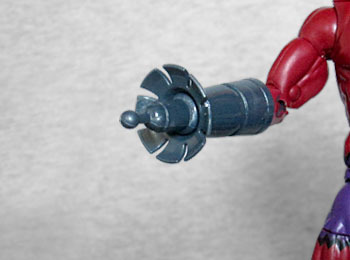 We didn't need need a new Klaw, since there was already one in the line, but the fact that my nigh-encyclopedic knowledge of action figures couldn't hold onto its existence shows that this new one is not unwelcome. And Shuri we definitely needed! When I first heard about this set I thought it was going to be movie-based, not comic-based, and I was really looking forward to that (a human figure of Andy Serkis? Yes please! ), but this is a good pair.